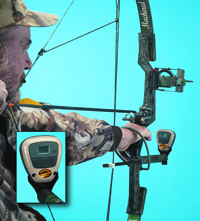 FINE-TUNE YOUR BOW & ARROW SYSTEM WITH YOUR OWN PERSONAL RADAR VELOCITY SENSOR! CHECK YOUR EQUIPMENT IN THE FIELD WITH THE ARROWSPEED RADARchron® –TAKE IT ON THE ROAD! EASILY ATTACHED FOR BOW SYSTEM TUNING AND REMOVED FOR HUNTING, TARGET SHOOTING OR RECREATIONAL PRACTICE. The Arrowspeed RADARchron®, a small, affordable microwave Doppler radar velocity sensor that measures the speed of an arrow as it is shot from the bow. It is an effective tune-up tool for use at home, in the shop, or in the field. The purpose of the Arrowspeed RADARchron® is to assist archers in assessing and optimizing the performance of their bow and arrow equipment. It uses microwave Doppler technology and does not depend on light. The device is easily attached to the 5/16”-24 threaded port on the end of most stabilizers. Sports Sensors, Inc. provides an extension rod if the archer does not use a compatible stabilizer. An adapter plate, also supplied, allows vertical positioning of the radar relative to the arrow flight path. The Arrowspeed Radarchron® is removed after system tuning for normal uses such as hunting, target shooting or recreation. The Arrowspeed RADARchron® measures the speed of metal and graphite/carbon arrows. The Arrowspeed RADARchron® is microprocessor controlled, like a mini-computer, and indicates calculated feet-per-second arrow speed on a toggling two-segment liquid crystal display. The range of speed measurements is 150 to 450 feet per second, within ± 2 % accuracy. The Arrowspeed RADARchron® is packaged in a rugged plastic housing, sealed to protect the internal electronics from dust, dirt and moisture encountered during normal use. It is triangular in shape, 2 1/2” wide; 3 1/2” long; and 1 3/16″ thick, weighing less than 3 ounces. Its’ one-button operation is simple to use. A three-volt, 160 milliampere-hour Lithium battery powers the electronics. This small N/3 size battery provides approximately 30 hours of operating life, representing over 3600 speed measurements. The Arrowspeed RADARchron® transmission level is well below that of most “wireless” consumer products such as cellular and portable telephones, for example. Transmission characteristics are well within FCC requirements and prescribed safety levels. Microwave operation of the Arrowspeed RADARchron® eliminates problems due to light, shadows, loud noise and associated environmental effects that are deleterious to other archery velocity sensors when used outdoors.